A Dall sheep in Denali National Park. Photo by Jeff Mondragon. Denali National Park and Preserve is the crown jewel of Alaska’s parks. Denali offers some of the world’s best opportunities to see a diverse array of wildlife. Dall sheep, brown bear, moose, caribou and – if you’re especially fortunate – wolves, can all be seen in a single day amid scenery unsurpassed anywhere on the planet. Bus tours make travel and viewing in the park easy. For more information, visit http://www.nps.gov/dena/planyourvisit/wildlife-viewing.htm. 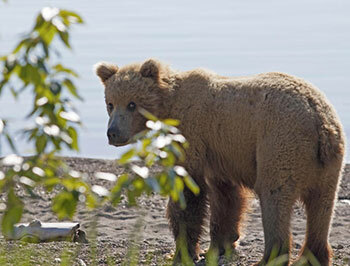 Kenai Fiords National Park offers wildlife viewing with an added maritime twist. A mix of estuaries, rugged coastline, forests and ice fields, much of the park is best seen via boat or air. Visitors taking any of several boat tours out of Seward can expect to see a variety of seabirds – including puffins, oystercatchers, and murres – and marine mammals such as sea otters, seals and several species of whales. Along the shorelines and mountainsides, black bears, brown bears and mountain goats may be seen. To learn more, see http://www.nps.gov/kefj/learn/nature/animals.htm. A young brown bear pauses to glance at the photographer along the shoreline of Naknek Lake in Katmai National Park and Preserve. Photo by Ken Marsh. Katmai National Park is famous for its brown bear viewing opportunities. The park’s Brooks River is the centerpiece, drawing bears to feast on the hundreds of thousands of salmon that arrive annually. At peak season in July, anywhere from 45 to 70 bears may roam this mile-and-a-half-long stream connecting southwestern Alaska’s Naknek and Brooks lakes. Learn more at http://www.nps.gov/katm/planyourvisit/bear-watching.htm. For more ideas and a complete listing of Alaska’s national parks, preserves and monuments, check out http://www.nps.gov/state/ak/index.htm. — K.M. If your timeline or budget won’t permit wildlife-viewing treks to Alaska’s far-flung corners, don’t worry: No matter where your travels take you in the Great Land, wildlife and wild places can be found nearby. 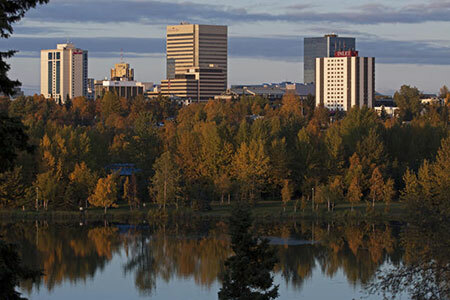 Alaska's largest city offers a number of wildlife viewing opportunities. Photo by Ken Marsh. Overlooking Anchorage, Chugach State Park’s Glen Alps trailhead is about a 15-minute drive from the city’s heart. Moose gather here during the September and early October breeding season, and Dall sheep are frequently seen, along with many species of alpine birds, including three types of ptarmigan; Arctic ground squirrels; and if you’re very lucky, bears, lynx or even wolverine. Kincaid Park, less than a 10-minute drive from Ted Stevens Anchorage International Airport, is another great place to see moose year-round. And within a 20-minute drive south of the city on the Seward Highway, pods of belugas (white whales) may be spotted in summer and fall chasing salmon on the tides of scenic Turnagain Arm. 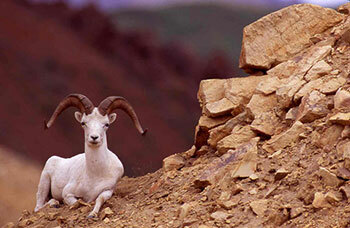 Dall sheep can also be viewed along the highway, grazing on the mountainsides. Anchorage isn’t alone for its urban wildlife-viewing opportunities. Creamer’s Field, in the Interior city of Fairbanks, is famous for its waterfowl viewing and opportunities to watch moose, lynx and even the region’s sole amphibian, the wood frog. Thousands of sandhill cranes pass thorugh the area in August. Learn more. 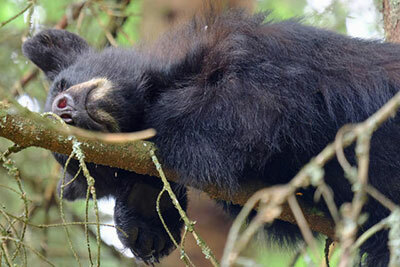 A yearling black bear sleeps in a tree in Juneau's Mendenhall Valley. Photo by Jennelle Jenniges. Alaska's capital city of Juneau offers a number of accessible opportunities. The Mendenhall Glacier is a 10-minute drive from downtown and just five minutes from the airport. A well-designed and carefully managed bear viewing area there provides an opportunity to view black bears in summer months fishing for sockeye and coho salmon; in 2018 about 20 different bears frequented the area. Managed by the US Forest Service, the Mendenhall Glacier Recreation Area offers miles of trails with short and longer loops and routes. Songbirds, beavers and porcupines are common in the area. Learn more about the Mendenhall Glacier and area.